One-on-one training is suitable for any doctor or healthcare professional requiring individualised coaching to address specific areas of concern or performance. Ideal for participants who may struggle to identify the reason why they are facing challenges, the training helps to recognise and address issues in a discrete face-to-face format. A skilled Cognitive Institute facilitator works with the participant to identify individual training needs and challenges, including barriers to change. Intensive coaching involves tailoring workshop exercises to address specific issues identified. Actors are then used to rehearse new skills. The participant will be able to identify, learn and practise strategies that can immediately be applied in the workplace. 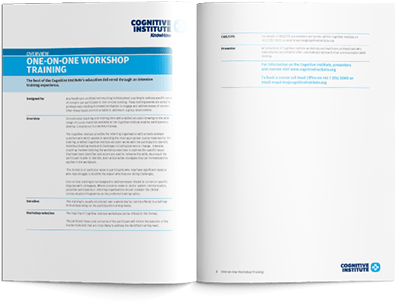 Whilst the structure for one-on-one workshops is guided by the participants needs and goals, the majority of Cognitive Institute workshops can be offered in a one-on-one format. For concerns relating to doctor patient communication or with colleagues, the Clinical Communication Programme is a highly recommended training option. The particular issues and concerns of the participant informs selection of the course materials that are most likely to address the identified training need. One-on-one training is usually structured over one day but can be offered in a half day format depending on participant training needs. Training dates are based on the availability of both the facilitator and participant. Please contact us to learn how we can accommodate either yourself or a member of your team. Face to face delivery with a highly experienced facilitator and actor simulated training, in a private training room selected by Cognitive Institute. Cognitive Institute’s faculty comprises senior medical educators who are experts in intensive interventions. They have first-hand understanding and experience of the challenges of practice today. Each educator has more than 20 years’ experience in healthcare education, and most have additional qualifications in either counselling, psychiatry or clinical leadership. Any doctor or healthcare professional requiring individualised coaching to address specific areas of concern. The One-on-one training is an intensive programme aimed at improving the performance of individual doctors or healthcare professionals. The programme promotes behaviour change and helps overcome specific issues by providing participants with a range of practical tools and strategies. The training will ensure the participant will be able to identify, learn and practise strategies that can immediately be applied in the workplace. 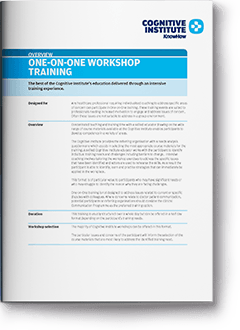 Please contact us to find out more about the costs for One-on-one workshop training. The best of the Cognitive Institute’s education delivered through an intensive training experience.